Located at the Chankanaab National Park in Cozumel, the Dolphin Discovery offers guests the unique opportunity to dive and interact with dolphins. The tour includes a briefing and the chance to dive about 25 feet to observe dolphins swimming and playing. You even get to pet, kiss, and hug dolphins. Are you planning to take a vacation to Cozumel, Mexico in the near future? If the answer is yes, then a perfect way to spend time on your vacation is to dive with dolphins at Dolphin Discovery at the Chankanaab National Reef Park in Cozumel. Guests have the unique opportunity to dive with dolphins in the stunning waters of Chankanaab Park. The beautiful lagoon-like waters of Chankanaab Park make it an ideal place to encounter dolphins. Dolphin Discovery and Chankanaab National Reef Park. You can even enjoy a wide range of shopping and dining opportunities that downtown Cozumel has to offer. Dolphin Discovery at Chankanaab National Park opens daily at 9:00 am. Dolphin dives are available every day except Sunday. Orientation for the dive starts at 12:00 p.m. and the dive starts at 2:00 p.m. To participate in the dolphin dive, the minimum age is 14. The cost of the dive is $189.00. 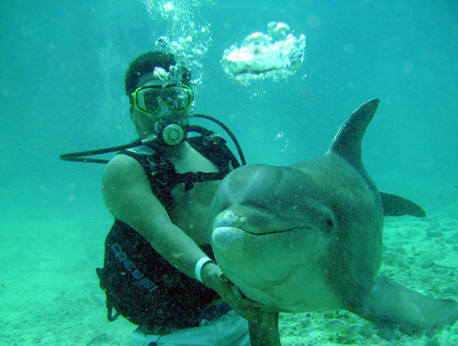 For an additional cost, you can even purchase photos of your time with interacting with the dolphins, which is a great way to capture the memories you made diving with the sea mammals. If you want to experience dolphins in their natural habitat, then the Dolphin Discovery is an ideal way to spend your time in Mexico. Being able to observe and play with dolphins in their habitat is an experience like no other, and you will create irreplaceable memories.